"When I was sixteen, I was sent to a psychologist because I was told I had an anger problem. "Anger isn’t my problem," I thought, "you're my problem" "You" being the adults in my life who didn't know how to talk to me. When I was told that I was angry, I just believed that I was an angry kid who couldn't change. One day my psychologist told me about a way he learned to let go of some of his anger. He asked if I would give it a go. I was skeptical, but I tried what I now know as mindfulness meditation, and I learned a powerful lesion about how I could change my own reality." Jason Murphy knows how angry kids feel. He's been one. He knows they feel alone, singled out, and misunderstood. He also knows how damaging and explosive expressions of anger can ruin teens’ relationships, devastate their families, and put their health and futures at risk. As a counselor, he knows your struggle to get at the root of their anger. Knows the challenges of developing a relationship built on trust and respect with adolescents who are angry, alienated, and skeptical that anything will help. Knows the frustration of trying to end the cycle of reactivity and be the one to move angry young clients toward a healthier and more balanced life. Full of practical applications, this recording will teach you to spark metamorphosis in your clients and effectively detoxify their anger. Cultivate transformation with motivational strategies that engage your most resistant clients and let them know that positive change is truly possible. Lessons on mindfulness, emotional regulation, compassion and problem solving are coupled with experiential exercises, skill building activities, and adaptable tools to reduce your clients anger response and empower them to manage their anger at home, school, and in their most important personal relationships. Skills that reduce negative self-talk and reframe the dysfunctional thoughts that lead to angered out-bursts, arguing, fighting, and out-of-control behaviors. 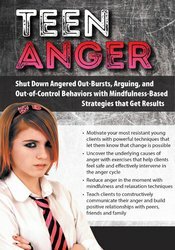 Relaxation techniques and disengagement strategies that lower the anger response and help teens walk away from destructive confrontations. Assertiveness training — teach teens to share anger constructively and without aggression. Functional coping and social skills young clients can use to improve their school lives and help them stay grounded and in-control when tensions rise. Characterize various manifestations of anger and how the underlying causes of anger inform the clinicians choice of intervention techniques. Engage reluctant or difficult to treat young clients with strategies that effectively communicate the possibility of change and create a safe therapeutic environment for them to share their feelings. Develop a case conceptualization for angry and aggressive young clients that promotes collaboration between therapist, adolescents and parents and strengthens the therapeutic alliance. Determine an approach for teaching clients to identify physical indicators of anger in-session and specify how this skill can be put to practical use in real world settings. Reduce the body’s anger response with progressive muscle relaxation and mindful breathing techniques that diminish anger in the moment. Teach clients how to communicate anger constructively with assertiveness techniques that increase their emotional vocabulary and enable them to manage stressful and anger inducing situations without aggression. Jason Murphy, MA, LMFT, CADACII, ICAP, is a consultant and educator with extensive experience over the last 2 decades of working with youth and families as a mindfulness-based psychotherapist and addiction medicine clinician. He is certified as a Mindfulness-Based Stress Reduction (MBSR) trainer and holds a license as a certified addictions counselor. Jason has taught mindful awareness in a variety of settings both in the U.S. and internationally. He has implemented MBSR in educational systems, corporations, businesses and community organizations. Jason holds a specialized degree in behavioral sciences with an emphasis in psycho-pharmacology from the University of California Santa Cruz (UCSC) and a BA in interdisciplinary studies with emphasis in psychology, philosophy and anthropology. Jason has training in Vipassana (Insight) Meditation and is a teacher of this tradition. He has studied meditation and martial arts for the last 20 years. Financial: Jason Murphy is the founder of Mindful Solutions and Mindfulness Recovery Counseling. He receives a speaking honorarium from PESI, Inc. Non-financial: Jason Murphy has no relevant non-financial relationships to disclose.